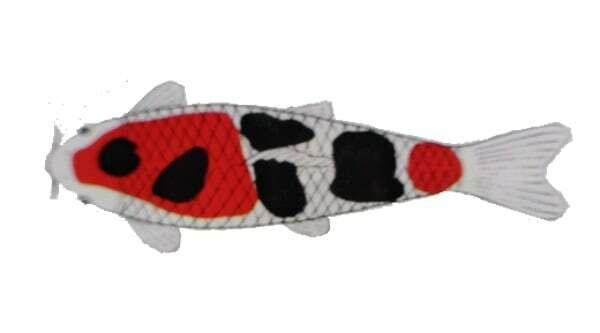 A koi with Hi and Sumi markings on white skin is defined as “Taisho-Sanke”. Its basic pattern is a Hi marking on the head and black stripes on the pectoral fins. It is a representative class together with the Kohaku. • White, or shiroji (sheer-row-gee), is the base color on Sanke. It begins at the nose and continues to the tail, including the fins. It should be clean, bright and not discolored in any way. • The red on Sanke is called hi (he) or beni (ben-ny) in Japanese. Beni tends to be more of an orange shade rather than a true, fire engine red. Sanke usually have large, reddish-orange patches that form the foundation of their color pattern, with the white base generally visible between the patches of beni. • Black, or sumi (sue-me), is the rarest color on Sanke. 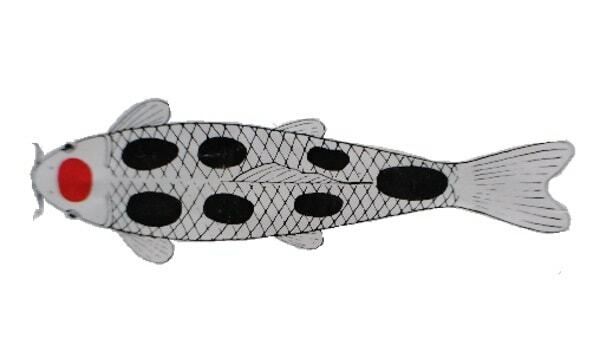 Generally, Sanke will have black spots, or sumi markings, that are relatively small when compared to the prominent beni patches. Sumi can be thought of as an accent color, while beni and shiroji are the primary colors on Sanke. It is not clear exactly when and how a tricolor black white and red koi had been bred, but it was found in the middle of the Meiji era. 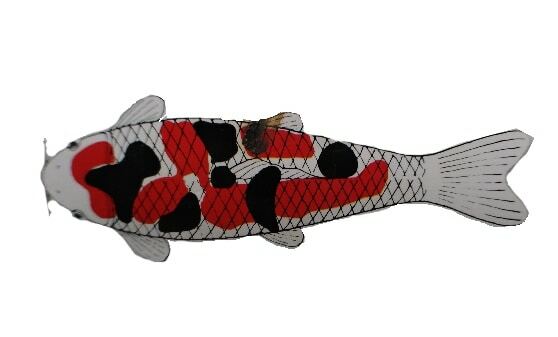 The first Sanke had black, white and red markings apart from one another all over the body and is distinguished from the present Taisho-Sanke. 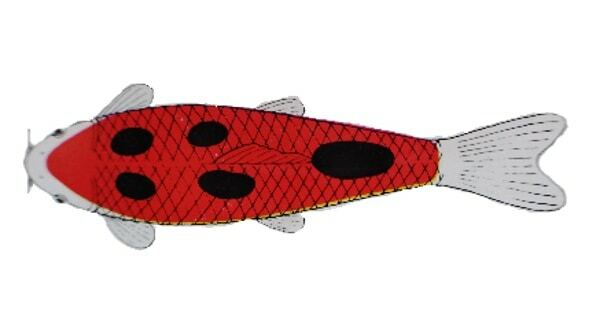 It ws Mr. Eizaburo Hoshino of Takezawa who bred the Taisho-Sanke with red and black markings on white skin. Later it had been greatly improved and splendid Sankes as “Jinbei” “Torazo” and “Sadazo” were bred. White skin The texture should be snow white. Hi should be uniform and dark. Clear edges are important. The head Hi should not spread over the eyes, jaws and cheeks. Hi should not cover the nose, either. A white part is necessary on the tail region. Symmetrical Hi pattern is desirable, Fins are not colored red. Excellent Sankes do not have Sumi on their heads. A big Sumi marking on the shoulder is important. It is very attractive (Fig-19). A Sumi marking on white skin is called “Tsubo-Sumi” (Fig. 4-20) and that on a Hi patch is “Kasame-Sumi” (Fig. 4-21). The Tsubo-Sumi markings are preferable. It is the best that these Tsubo-Sumi markings appear symmetrically. Roundish Sumi markings look elegant. Sumi should not spread widely on the latter half of a body. It is ideal that a fin has about three black stripes. A fin with fewer stripes looks more elegant than that with many stripes. It is the Taisho-Sanke with silver lumps on the head. 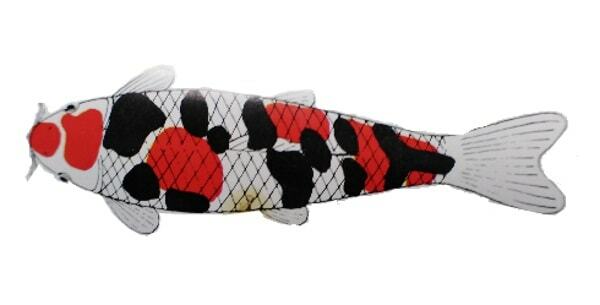 The Kohaku, Sanke and Showa varieties of koi are collectively known as the gosanke. In this case the “go” does not mean five, but refers to three noble Japanese families. The highest quality of skin and colour is to be found amongst the gosanke and for this reason grand champions are usually selected from these variet­ies. A Kohaku is a white koi with red pattern markings while Sanke and Showa are three coloured koi; red, black and white. Showa and Sanke appeal to all types of hobby­ists, especially those who want to show their koi and compete for top awards. It is not easy to raise a koi with three colours of high quality, but for those that can achieve this feat, there is the possibility of having a grand champion. Hobbyists and even benching teams sometimes have difficulty in deciding whether a koi is a Sanke or a Showa. It is often said that a Sanke is a white koi with red and black pattern markings and a Showa is a black koi with red and white pattern markings. It is true that when breeding Showa the all black fry are kept at the first cull. However, this does not help to distinguish larger koi exhibiting all three colours. In his book, Dr Takeo Kuroki referred to Mr Eziburo Hoshino as being the first to breed Sanke while Peter Waddington credits Mr Kawakami (Torazo) as being the first to breed Sanke in 1915. The Sanke variety has its ori­gins in the reign of the Japanese Emperor Yoshihito and the period of his reign (1912 —1926) was known as the Taisho era. Taisho means “great righteousness”. Sanshoku means three colours and the proper name for a Sanke is Taisho Sanshoku or Taisho Sanke, which is com­monly abbreviated to Sanke. What does Doitsu mean in Koi? What are the different types of koi? Are butterfly koi real koi? As Butterfly koi grow, they become more and more impressive because the fins keep growing until the blood vessels can’t sustain the fins to be any longer. … Butterfly koi seem to lack some of the body size of regular koi, but the overall fish can run as long as 36 to 40 inches in the right pond with plenty of food. What type of fish are koi? Koi fish is domesticated version of common carp. This fish is most famous by its beautiful colors that have been created via selective breeding. There are over 20 different varieties of koi fish that differ in color, patterns and type of scales.